The week opened with a strong rally in Chinese stocks, with the CSI 300 adding 4.32%, its best day since 2015, making 6.8% over two days. Similarly Italian stocks and bonds rallied briefly after Moody’s Friday rating left the country bonds as still investment (as opposed to junk) grade—just. However concern still weighed over the Italian budget. The net result of all this was a very mixed bag. DAX and NKY were flat, whereas in the US SPX and DJIA faded 0.4% and 0.5% respectively, but NDX (unaffected by Europe or bonds) was up 0.3%. FTSE was also up, following the stronger Oil price after vague concerns about the need to take action against Saudi Arabia after the Khashoggi affair. The picture was clearer in currency. 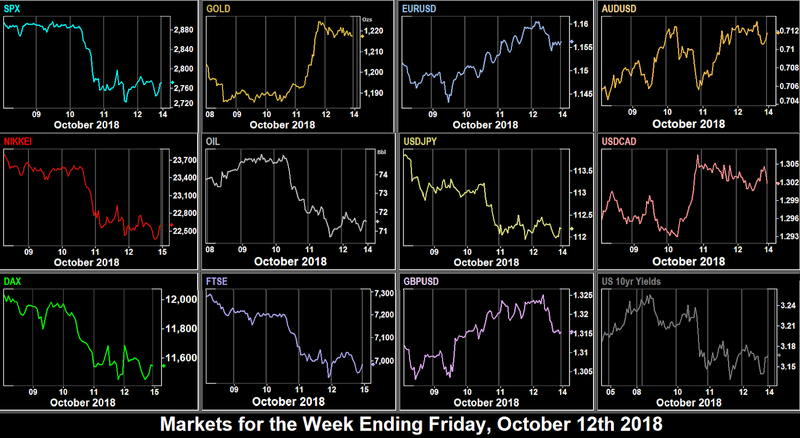 Continuing last week’s direction, DXY was up 0.38% and all currencies and Gold faded, and US Treasury 10-year yields were up in line. A definite Turnaround Tuesday for the CSI300 which gave up most of Monday’s gains, and Italian bond yields rose again as the EC—as predicted—rejected the Italian budget as incompatible with EU fiscal rules. Oil fell sharply with WTI down 5%, and BNO a little more, in line with the Chinese move, and on reports that Saudi Arabia could provide more output quickly if needed. Indices all fell, heavily at first, but recovered as bond yields fell 2bp. DXY was virtually flat on the day (-0.08%), as all currencies (and Gold) moved up, but only very slightly, although Gold hit an intraday three month high at that point when SPX was down over 2%. NZD was completely flat. The rout continued today, with SPX down 2.58%, and DJIA down 3.90%. BA opened the day with blowout earnings (EPS 3.58 vs 3.47), and crucially a substantial upgrade in Q4 guidance. It is a measure of the current mood that this only briefly lifted the stock 5% in the pre-market, and most of this had evaporated by the close, leaving the aircraft maker down on the week. FTSE, DAX and NKY also fell hard. MSFT after the bell was similar story. A substantial beat on EPS (1.14 vs 0.96), a revenue beat and no guidance change still saw an initial AH spike down of nearly 7%, although the the stock then recovered. It was a similar story with T which beat on revenue (although not EPS), gave up 8% instantly, to end the week 11.9% down, a seven-year low, and the worst week for ten years, ie in the middle of the 2008 financial crisis. DXY was up 0.42%, and most currencies duly fell. However, the picture was not uniform. The yen, and for once, Gold did what they are expected to do in equity risk-off, and advanced. Also up was CAD after the BoC increase rates by 25bp to 1.75%, despite this move being widely expected. The loonie did what it usually does, a sharp spike (116 pips/0.89%) and then started to retrace, and ended the day up 0.23%. The surprising move was in yields, which fell sharply by 6bp, but sharp unexplained moves are often seen at elevated levels. 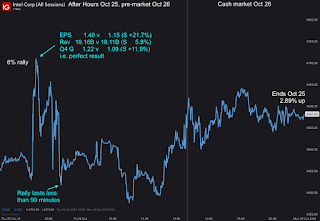 Finally some relief came today, as markets rebounded, with tech leading the way as TWTR’s beat before the bell on a 50% surprise EPS (0.21 vs 0.14), and subsequent 14% leap, coupled with tiny SHOP (revenue a mere $270m) crossing the vital line into profit (EPS +0.04 vs -0.03) gave a somewhat irrational exuberance to AMZN and GOOGL buyers before earnings. The two giants put on 4.63% and 2.16%, in line with NDX as a whole rising 3.35%, its best day this year. SPX (+1.9%) and DJI (+1.0%) rose more modestly, as did DAX and FTSE, although NKY failed to move at all. The closing bell was however a handbrake turn performance for tech.. Remember the ‘pass mark’ is 100% these days—all metrics must be beats. AMZN had a stellar EPS beat (5.75 vs 3.14—an 83% beat for the second largest company in the world is amazing), and a tiny 0.8% miss on revenue), but a reduction in Q4 guidance knocked 7% off the price AH. The GOOGL story was similar, they surprised by +25% on EPS, but only missed by 5% on revenue. Some economists would say making more profit on less revenue is a good thing, but not the market—the stock dropped 5%, although over half that was clawed back on Friday. Just to confirm how negative sentiment is this week, INTC announced a perfect scorecard, and faded its 6% rally in under two hours in the AH market, and only ended up 2.89% up the next day as shown here. It was inevitable that DXY would have a good day. At the ECB rate meeting conference, President Draghi had little choice but to be dovish, so as not to cause a further run on Italy, and EUR duly fell. GBP also fell on Brexit worries, JPY and Gold on the risk on mood, and CAD doing its usual retracement after the rate hike spike. Only AUD appreciated on the day. Oil was up slightly in line with equities, and bonds were flat. Notably CNH hit a new 10-year low against the dollar. Thursday was only a brief respite. The tech results cast a pall over the whole market. Although the pre-market actually opens at 0900, it tends to be 1230, an hour before the US Open that the market take its cue from the economic releases at that time. Although GDP beat (3.5% vs 3.3%), the Core PCE miss (1.6% vs 2%) was probably more significant as the drivers for Fed rate decisions are the dual mandate, jobs (NFP) and inflation (CPI), not growth. PCE is an inflation proxy. Notably, the safe havens of bonds and JPY both spiked up on the report (ie USDJPY and yields fell) but retraced some of that quite quickly as you can see on the main chart. It remains to be seen whether bonds will continue to behave as risk-off havens. SPX fell 1.7% and NDX, where AMZN and GOOGL reside gave up 2.2% on the day. Another hint that the malaise was earnings and not economic news driven was that DAX and FTSE were positive on the day, despite appreciating currencies. DXY pulled back 0.28% in line with the PCE miss, and all currencies and Gold advanced, except CAD, which finished off the retracement of its Wednesday rate hike spike. Oil was a shade higher but still down on the week. A second good week for USD, with DXY adding 0.69%, and gaining everywhere except the yen, reflecting the risk-off mood in equities. Sterling was the weakest currency, the negative sentiment increases as we get closer to no-deal Brexit, and so shorting GBPJPY with its 2.51% bearish engulfing bar would have been the best trade. Indices were sharply down, with NKY giving up most on the stronger yen. Cryptos had their flattest week for years, moving less than 1%, and the FAANGs were badly hit, as NDX dropped 4.11%, its worst week since February, driven by disappointing earnings guidance from AMZN, although NFLX suffered worst. On Sunday the Brazilian elections are expected to confirm right-winger Jair Bolsonaro as President, and we start the week that happens this time of year every year where North America and Europe are one hour less apart. DST in North America starts two weeks earlier than Europe and ends one week later. Fed Evans speaks today at 1345. Today is also the UK’s budget statement, the surprise part of which is mainly tax changes. British stocks can be affected, particularly in regulated industries. The main items are usually revealed around 1200-1300. Like last week, there are no major earnings releases today. We have listed an Italian report for the first time this week (we normally only list Germany among the EU nations), given the current volatility in Italian assets. Of less interest is Eurozone GDP, reported an hour later because as we have said before, the individual countries report beforehand. 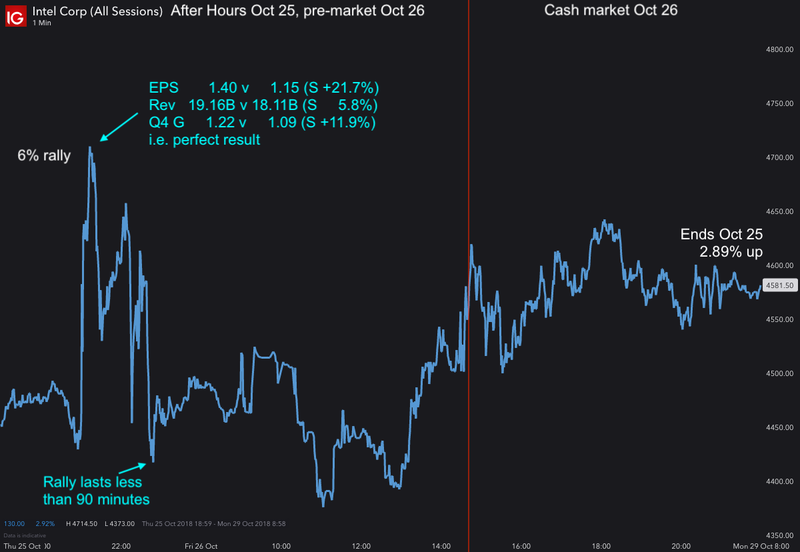 DJIA components KO and PFE report before the bell, along with V’s competitor MA, beleaguered giant GE, and car maker FCAU. FB is the final FANG to report, its earnings come after the bell, along with fellow tech companies BIDU, IQ and EBAY. The stock has been hammered recently, but as we have seen, an EPS beat on its own may not be enough for relief. The last day of the month, Hallowe’en is the end of the six-month summer seasonal cycle, where defensives typically outperform risk industries. There is more action than usual in the Asian session. ADP at 12:15 estimates 5k more than NFP. As always a large beat or miss can jump the gun on the ‘official’ result on Friday. GM report before the open. It will be interesting to compare the results with FCAU, and see how much steel and aluminum tariffs are mentioned. Don’t forget EIA stock, now that Oil is reacting to it. The new month starts today, and is traditionally the start of the winter six month seasonal cycle (risk stocks outperform). Banks are closed in Spain and Italy for All Saints Day, but not their stock markets. There is a rate decision in CZK, a 25bp hike is expected. Today is the pinnacle of the earnings season, with 491 companies reporting, the most of any day in the season, and of course AAPL, the biggest company in the world reports after the bell. It is likely that the AAPL result will set the tone for the whole market. Note that AAPL do not usually release until about 2130. It’s the first Friday of the month so it must be NFP day in the US and Canada, so as always, USDCAD volatility is assured. The US estimate is 190k again, the ‘default’ estimate, well above last month, whereas the Canadian estimate is modest after last month’s blowout result. Remember how USDCAD works, one piece of news often retraces the price move from a previous one. We have the two NFPs and US Trade Balance at 1230, and the Canadian trade balance an hour later. BABA is the second BAT (Baidu-Alibaba-Tencent) stock to report this week,, before the bell. US and Asian equities continued last week’s slide today, starting with the Chinese CSI300 dropping 1.3%. SPX and NKY ended down on the day, not helped by the big miss (-0.1% vs +0.3% est) on US Retail Sales at 12:30. 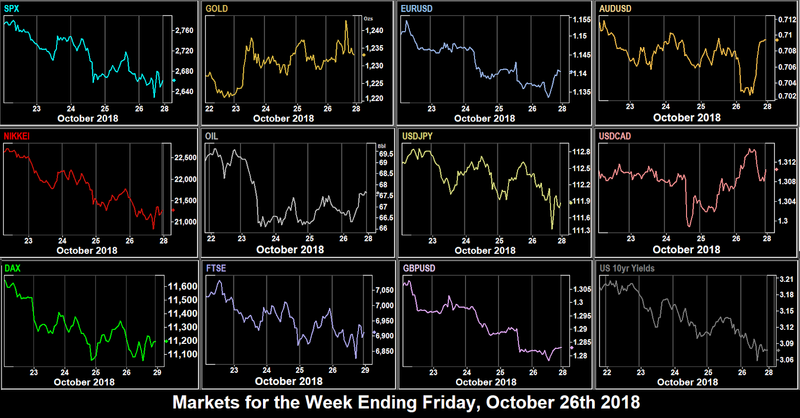 Saudi Arabian tensions over the Khashoggi affair weighted, and the US sell-off came after the European markets closed, leaving DAX and FTSE positive on the day, in fact DAX added 0.8%, perhaps because Italian bond yields stabilised. Saudi worries also affected DXY which was down 0.32%, with all currencies advancing, even GBP, which fell in the early session on Brexit deal problems. Gold and Oil were also up in line with the weaker dollar, the former hitting an 11-week high of $1,233 at one point. Yields were up 2bp. Earnings beats from major DJIA components GS (up 3%), JNJ and UNH (up 4.6%) gave SPX its best day since March. SPX and DJIA added 2.2% and NDX added 2.9%. NKY, DAX and FTSE also advanced strongly. GS and MS earnings helped lift the entire banking sector, and UNH the entire healthcare sector. Italy submitted its budget to the EU on time, and MIB rallied over 2% and the two-year BTP yield fell 16bp. Despite the Italian news, EUR was flat. There was a pullback in JPY on the risk on mood, coupled with a rise in GBP on the strong, and above inflation average earnings print (3.1% vs 2.8% est) at 08:30 resulted in a flat DXY. CAD and AUD were up slightly, as was Oil. Gold gave back some of Monday’s gains as did US 10-year yields. The Fed minutes often strongly lift USD and yields and today was no exception. The hawkish message was that the rate hike plan is to continue, despite noises from the White House. DXY added 0.59% and all currencies pulled back sharply against USD. JPY had been advancing earlier in the day, but joined the part after the minutes were released at 18:00. GBP had been falling all day on further Brexit woes, despite the Core CPI beat at 08:30. Yields rose 4bp to 3.21, only 6bp away from last week’s seven-year high. Oil fell sharply, down nearly 3% on the day after the EIA stock miss, and of course on the stronger dollar. Gold was flat on the day. Equities took a breather, and SPX and NKY were flat on the day. DAX was down as the 10-year BTP yield rose again, and on a report of reduced car sales (DAX is 20% automotive), and FTSE fell in line with the Oil pullback. After well-received earnings on Tuesday, the only major report today was from PG, who beat on EPS (0.94 vs 0.90) but missed on revenue (16.50B vs 16.54B). Despite the imperfect result the stock rallied 8.8%. After the miss on US Existing Home Sales at 14:00, this led to lacklustre day with a early rally in SPX fading back to flat. DJI managed a small gain on the PG rise, although the stock is only 2.12% of the index. 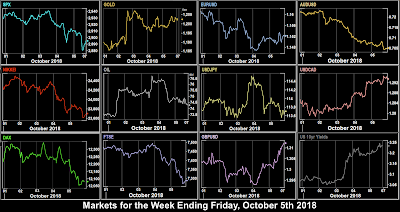 NKY and the European indices did better, with small gains, particularly for NKY as JPY pulled back, and for DAX on surprisingly conciliatory comments from EU Commissioner Moscovici on Italy’s budget, which led BTP yields—which had earlier in the day hit a four year high of 3.85%—pull back 33bp from there to close at 3.51%. The late sell-off may have also been linked to monthly OpEx day. After two good days, DXY pulled back 0.32% today, largely because of the positive response by EUR to the Italian news. GBP and AUD were also up, but CAD was down after the CPI miss (1.5% vs 1.8% est) at 12:30 as was JPY as risk-off faded. Gold and Oil were up in line with the weaker dollar, the latter also being bolstered by the Saudi situation (If the US ever imposed Oil sanctions on Saudi, Oil, or at least the BNO/WTI spread would rocket in price). DXY pulled up again this week, but only by 0.31%, and lost ground against non-DXY currencies AUD and NZD. The best forex trade was shorting GBPNZD, down 1.91%. Weak GBP made FTSE the only index winner this week, and the strongest mover, in a generally flatter equities week. Cryptos staged a small recovery, although volatility continues to fade. FANGs continued to fall in line with the general mood, although FB managed to stay flat. The first full week of earnings season opens quietly, with little news. All eyes will probably be on the reaction by the US and Europe to the Khashoggi murder now that the Saudis have admitted killing him. Areas to watch are defence stocks and the BNO/WTI spread (Saudi oil is priced in BNO). New Zealand markets are closed for Labor Day. This may have an effect on the start time for the Sunday afternoon/evening forex quotes in the US and Europe. A big day for earnings with VZ, CAT, MCD, MMM and UTX all reporting before the bell. Their combined weight is 18.18% of DJIA. Some pre-market DJIA/SPX futures divergence is distinctly possible. There are no economic releases (which affect the major currencies) at all today, the first time we can remember, and certainly for over a year. FOMC Kashkari (the most dovish and not a voter, so not very important) speaks at 13:30. BoE Chief Economist Haldane speaks in Paris at 10:30. There are rate decisions in troubled EM countries Argentina (hold expected) and Indonesia (25bp hike expected). Less stocks today but heavier weights. BA is the largest component (9.49%) of DJIA and reports before the opening bell. After the closing bell, the most important companies reporting are MSFT (10.17% of NDX) and V (3.73% of DJIA). Also reporting after the bell are once-great but now troubled giants F and T, and gold miner (and gold proxy) ABX. The most important economic release today is the Canadian rate decision where a 25bp hike is expected (97% priced in), despite weak Canadian data. September CPI missed estimates but is still above the BoC target, which like the US is 2%. There are four Fed speakers today: George (the most hawkish, 2019 voter) at 0000 in Sydney, Bostic (dovish, 2018 voter) and Mester (hawk, 2018 voter) both at 1700, and Brainard (was a dove, now only dovish, makes her more interesting, as it proves she can be swayed by evidence, 2018/2019 voter) at 2300. The Riksbank are expected to hold the SEK rate. 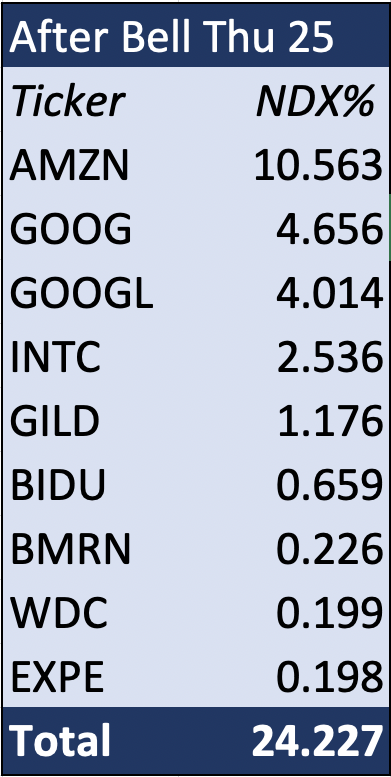 Probably the biggest day for NDX of the whole earnings season, as AMZN, GOOGL, and INTC report after the bell, along with 372 other stocks today, the most in one day so far this quarter. NDX stocks CELG, WYNN and AAL report before the open but they are only 1.05% of NDX combined. However, the after-bell reports total 24.23% of the tech index. If you can’t trade these stocks after hours, you can still trade NQ_F, the NDX futures instrument. For Europe-watchers, troubled DB report after the European bell. On the schedule, the most important news is the Euro rate decision and conference. Of particular interest today is the new Fed Vice Chairman Richard Clarida, who will be speaking at 16:15 for the time in this role since his appointment in September. He is an economics professor and former director at Pimco, so we know he will have a strong feel for bonds! It remains to be seen how hawkish he is. There are rate decisions on TRY, NOK and UAH. No significant earnings today, so the important news is US GDP at 12:30. As usual the report comes with the quarterly PCE (inflation proxy) figure. There is a RUB rate decision, hold expected. Looking forward into the weekend, the presidential election in Brazil is expected to confirm right-winger Bolsonaro, and regional elections in Germany are expected to cause losses for the ruling CDU. Also, daylight savings time ends in Europe but not in North America or Australia. For two weeks, European traders will see US markets open and close an hour earlier than usual. It also means that the UK will move to exact GMT time. 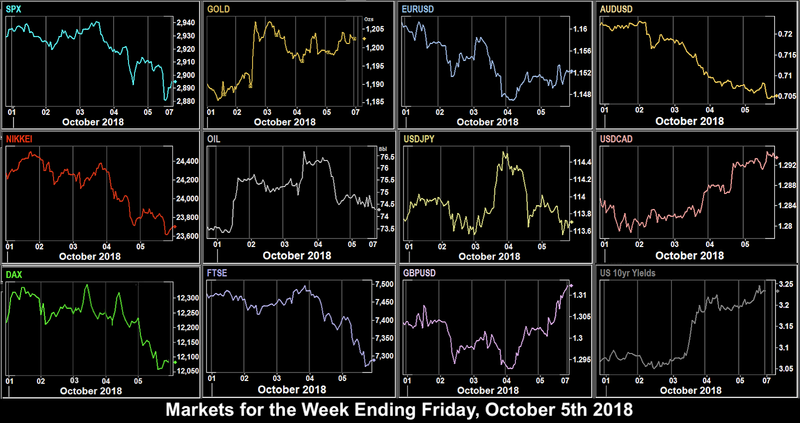 The US stock market was open on Columbus Day, when concerns about the China trade war and Italian politics continued the downward slide in markets seen last week. The Chinese CSI300 had its worst day since February, and MIB fell 2.4% after the EC warned that Italy’s budget plans would break EU rules. All indices fell slightly, but with the US bond market closed, there was no direction for USD. DXY advanced very slightly (0.09%) with downward movements from Gold and all currencies except AUD and JPY, the latter reflecting risk-off mood. Oil was slightly up on the day. Unusually today, the worries switched back to the US. Italy’s bonds and stocks recovered, with MIB recovering 1.1%, leaving DAX flat on the day. FTSE and NKY were down slightly due to currency strength. The bond market re-opened and yields briefly touched a new seven-year high, SPX fell again, but was only down by 0.1% at the close after bonds finished 2bp down. 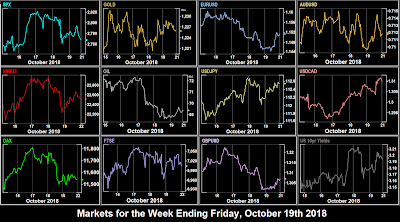 Similarly, currency movements were muted with DXY flat (down 0.08%) on the day, and with no variations, every currency was very slightly up, as was Gold and Oil. The constant pressure from bond yields (Monday’s high was 3.248%) which are now nearly double the dividend yield of SPX (currently 1.89%) meant something had to give, and today indices fell hard. SPX fell 4%, in a near-marubozu red candle, and other indices followed suit. DAX was down 3.21%, FTSE a relatively mild 1.27% and NKY 3.46%. VIX rose 43%. USD also fell against EUR and GBP, the latter despite the GDP miss at 08:30. JPY was particularly strong, as would be expected, leaving DXY 0.23% down. However risk currencies AUD and CAD fell hard, as did Oil. As we pointed out a few weeks ago, Oil often falls in line with stocks, indicating reduced growth. Yields pulled back, but ended the day flat. As often happens after sharp falls, there is a follow through day, and this is what happened today. All indices were down again, with SPX giving up and falling below its 200-day moving average for only the second time since June 2016. The inflation miss at 12:30 did not help. Further downside was probably mitigated by a sharp pullback in yields, down 8bp on the day. Oil was down following the EIA stock miss at 15:30 and in line with stocks. The follow-through happened with USD as well. DXY was down 0.45%, with all currencies advancing, particularly AUD, after Gold, somewhat late to the risk-off party, put in its best day in two years, adding 2.5% or $28. Earnings season starts in earnest today, and JPM, C and WFC reported before the bell. The first two beat on EPS but all three missed on revenue. Nevertheless, sentiment shifted and US indices recovered part of the previous two days losses. 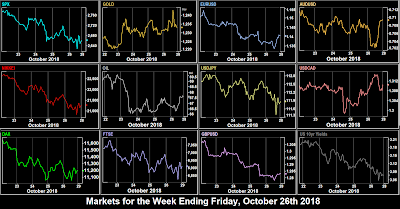 Foreign indices were still slightly down on the day (NKY was flat).It was still the worst week for indices since February, and in the case of RUT, the worst since Jan 2016. DXY was quieter, adding 0.2%, gaining against all currencies except CAD, which advanced slightly, to be usual the least volatile, and the only currency to beat the dollar this week. The release of the US pastor in Turkey had a surprisingly muted effect on TRY, up only 0.73%. Oil was slightly up, and Gold gave $6 back of the previous day’s huge move. DXY retreated 0.4% this week, with all currencies except CAD advancing. JPY was the strongest, in the risk-off environment, so a CADJPY short would have been the best forex trade. Indices of course fell heavily (except NIFTY, which did it last week). Note that the foreign indices fell more than the US but if you take into account the currency movements (ie a DAX short is placed in euros), SPX was the best short. Cryptos resumed their downward trend, and again ETH suffered more than BTC. FAANG performance was uneven, with AAPL holding up well, and AMZN being the best short. A US Treasury report is due today, the key takeaway of which is whether China will be branded a currency manipulator. Commentators don’t think it will happen, but if it does, expect Chinese stocks and CNY volatility. Also the Italian budget is presented to the EU, who are expected to reject it as incompatible with deficit rules. The bank earnings continue with BAC reporting before the bell, and of course we have US Retail Sales. The Bavarian election result is due, with a possible CSU loss of majority. A big day of earnings with GS, JNJ and UNH (together 16.25% of DJIA) reporting before the bell, along with MS, and NFLX (1.8% of NDX) and IBM (3.77% of DJIA) reporting after the close. UK earnings are the big news release of the day. There is also a rate decision on HUF, hold expected. The EU Brexit summit today is focused on the Northern Ireland border issue, which has become the main sticking point in negotiations. Remember that the ruling Conservatives are only in power with the support of the Northern Irish DUP, who strongly oppose a hard border. Staying with the UK, yesterday’s earnings figure is followed by the inflation print. GBP could have a volatile day. The monthly FOMC minutes are of course important. The market current expects another 25bp in December, and is divided on March 2019. Trader will be looking for any language which varies this view. Another day, another GBP print, but Retail Sales is less important, coming after CPI as the former is, in the end, a proxy for the latter. The Australian jobs report is important. The estimate is modest, and a beat may well add to the shaky recovery of AUD. ISRG (0.74% of NDX) report after the bell. There are rate decisions in CLP (hold expected) and KRW (25bp hike expected). Attention turns to Canada today with the simultaneous inflation and Retail Sales reports. Now that NAFTA is concluded, these reports may start to have more significance. PG (2.12% of DJIA) reports before the bell. Today is OpEx day, so expect additional volatility. 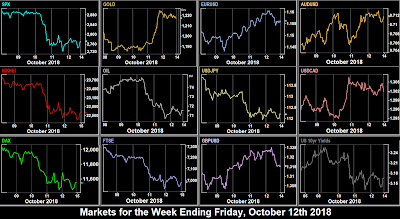 Not really a Turnaround Tuesday this week, as US indices continued to move as Monday (SPX slightly up NDX down, DJIA slightly up to a new record close). BTP yields added another 15bp, their highest level in four years, which kept DAX in the red (as did negative sentiment about the Paris Motor Show), and FTSE was also down again, today’s casualty being TSCO.L, down 8.6% on an earnings miss. NKY fell on a stronger yen. The big story today was US bond yields, which soared 11.8bp, the largest one-day rise since the day after the Trump election nearly two years ago. 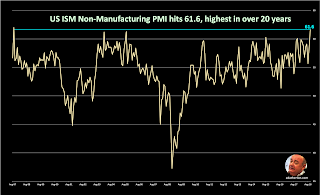 This has of course been the trend, but the trigger was attributed to a strong beat, and 20-year record (61.6 vs 58 est, prev 58.5) in the ISM Services PMI at 14:00. 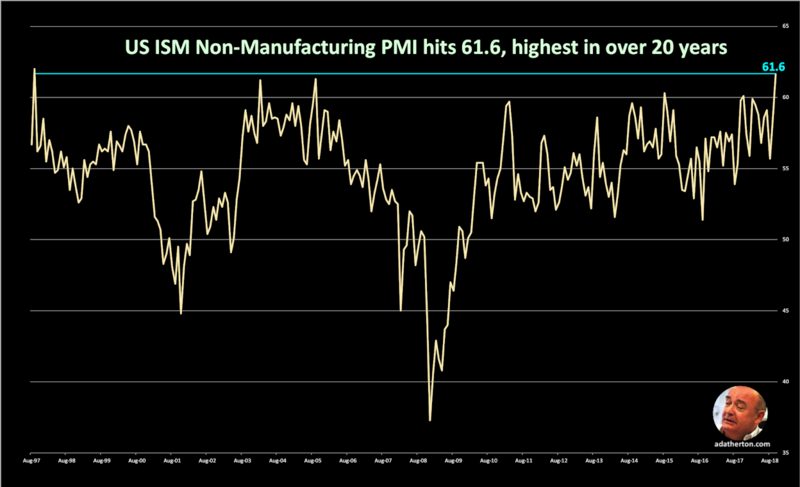 This is not normally a very important indicator, but a large and record beat is another matter, as we have often said about PMIs. The first major stock Q3 earnings are today, with three banks JPM, WFC and C all reporting. Next week sees much more earnings activity including NFLX on Tuesday. The trial of Pastor Brunson is held in Turkey. If he is released, expect TRY to soar, and by extension, relieve some EM pressure. The IMF begin their meeting in Bali. Note that there are elections on Oct 14 in Bavaria, where any rise in the far-right (anti-immigrant anti-EU) vote will be unwelcome by markets.